If you’re like most people, you own a decent amount of stuff; stuff that holds sentimental value, monetary value, or both. Losing it all, in a fire or flood for example, is what common nightmares are made of. But what if it wasn’t a natural disaster at all, but rather a team of movers that came to steal everything you owned away? Believe it or not, it’s a common scene across this great litigious land that we call America. It’s so common in fact, that we’ve now developed ways to protect ourselves against man-made disasters the same way we do against the natural sort. It’s called Asset Protection Insurance. So what is it precisely? Asset Protection Insurance was created to protect professionals, their spouses, and beneficiaries (when applicable) vulnerable to catastrophic lawsuits. This coverage helps protect the professional’s property interest by insuring 90% of the loss in fair market value of the property caused by a legal judgment. Here’s an important thing to note: Asset Protection Insurance is NOT malpractice or professional errors & omissions insurance. Malpractice policies generally cover only the first $1,000,000 of a catastrophic claim. 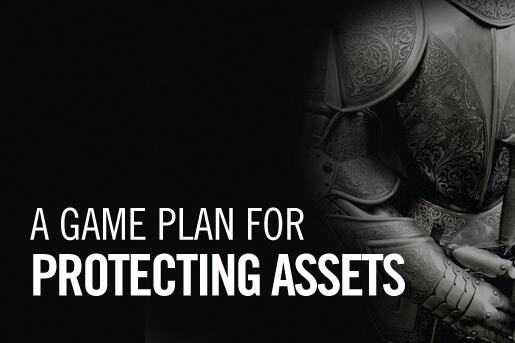 Asset Protection Insurance is designed to protect personal assets when a rendered legal judgment exceeds existing insurance limits – an outcome that is becoming increasingly common. When a judgment causes personal assets to be lost (home, property, cash, securities, etc. ), the Asset Protection Insurance policy will replace up to 90%* of the loss in value of the assets to the named beneficiaries. So next time you wake up in a cold sweat over a fictional fire or flooding, you might want to think about asking your insurance agent if they would also recommend Asset Insurance Protection for your situation. Click here to view more information.